I thought I asked about this in a different thread, but I couldn’t find my question. Are the results of this study inconsistent with the UAH TLT or TMT trends? Thank you, William. I had gotten the impression the results were different where they overlapped. Another question. Are these findings evidence of polar amplification? It seems so, but there seems to be a weak link; the paper states the chages are what would be expected as a result of increasing greenhouse gasses, but is unable to make an unabigous attribution. My impression is that models have known weaknesses in simulating Antarctic climate. Is it reasonable to expect model improvements will resolve this? Why are scientists from the British Antartic Survey (http://news.bbc.co.uk/1/hi/sci/tech/4857832.stm) stating that the reason for the warming in unclear and that (IPCC) climate models appear to be incorrect and have not shown this warming. This is running counter to what realclimate appears to be stating ? I know that Science is not always neat and tidy ! However it would be best if Science gave a unified front on climate results, average people reading the BBC article will assume that science is a load of twaddle and climate chnage is just a left wing conspiracy to stop everyone from enjoying themselves. Er, Pete — if your “best” existed — a Science, singular, stating one unified front on climate information — — what would people be likely to think? Oh, wait. It’s April 1st …. Pete, what would a unified front look like? This perhaps? As for the media, don’t blame the scientists, and as for the annoyance of uncertainty and conflicting findings, well, blame real life. on it but it’s not totally convincing in that it really just says that a lag is not inconsistent with CO2 being a key contributor. It seems to rationalize the lag away a bit. Can anyone point to some specific research or models that put things on a firmer footing? I am looking for some concrete data or findings or models. Obviously this is currently a hot-button issue and, while I am pretty convinced that CO2 plays an important role (e.g., on grounds of radiative forcing) I would like a better handle on the nuts and bolts of the argument. After reading the L.A. Times version, a direct read of the paper is in order. It will be interesting to see how those intimate with modeling continue to suss out the results and implications. Question…. I seem to recall significant transient temperature inversions occurring at the poles, at least in the Arctic darkness of winter. Does the Antarctic region experience this? I didn’t see any mention of inversion layers or unambiguous stratification evidence of it in the paper discussion. Would a trend towards an increased standard deviation in the sample data be evidenced? Would enjoy being corrected or more explication if one has the time. Thanks. Is 600 hPa level well above most of Antarctica’s surface? The stratospheric cooling is also a GHG effect. Is it more, less or equally important above Antarctica’s troposphere? Would it be possible for you to post a typical sounding from 1975 and from 2005 either here or on your blog? I am curious to know it the inversion layer has changed height. The new research, led by John Turner, of the BAS, shows that the air above the surface of Antarctica is definitely warming, in ways that are not predicted by climate models and that cannot yet be explained. The results are published today in the journal Science. Again it just seems to show that realclimate evidence is not the same as the BAS and I would ask why not ? Why do the BAS state that no climate models have predicted Antarticas recent results ? William says in this article that the amount of warming observed is not in agreement with the models. I don’t see the contradiction you are suggesting. Don’t forget that in this instance Science, BAS and RealClimate are all precisely the same person, so you might read more carefully and see if your perceived discrepancies are not actually your own misunderstandings. From the first paragraph of this article. Contrary to what you might have heard, this is in general agreement with model predictions. BAS state that current climate models are not able to demonstrate Antaritcas recent results. It is all too tempting to over-interpret the results of a paper like this. At face value, the trends cited in this paper apply only to the period 1971-2003. In some cases, not even that – for instance, Bellinghausen data end in 1996. I think we shouldn’t interpret this paper much beyond face value. 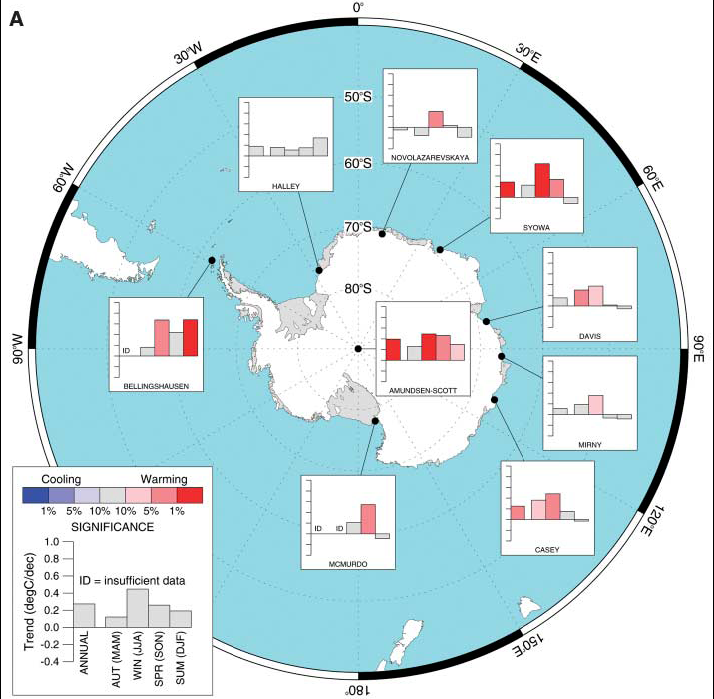 Antarctic temperatures, especially in winter, are characterized by large variability. Where data are available, one can examine trends with different starting and ending dates and find that they very dramatically from the 1971-2003 period cited by Turner et al. All these trends are well within the range of interannal variability, and it seems premature at this point to go searching for a “cause” of the trends. Another technical point is that 600-hPa is right at the top of the surface inversion at the South Pole (and probably over much of the plateau). That means temperatures at 600-hPa are about the highest to be found in the vertical profile; temperatures just above and below 600-hPa are typically much lower. Any thoughts on the implications of this for a trend study of the 600-hPa temperatures? If you look at Turner Fig 1a, temperatures at the 500-hPa level (which is pretty much over the inversion top everywhere), all have lower trends than the 0.7 deg C per decade trend at 600-hPa. The 500-hPa trends max at about 0.65 deg C per decade at Syowa, which implies that the average trend for the continent is lower. Thanks – I do undersatnd the difference but what I can’t see is how the data from the long term record shows that CO2 is responsible for warming – not causing it but exacerbating it – as opposed to the excees CO2 being a consequence of warming. I understand that this argument is that of the naysayers but since I am in a bit of an argument over this (with a naysayer) I’dreally appreciate a bit more on this from someone. yes, you are missing the fact that “this” in your quote refers to the very small trends at the surface, not the new findings. Bob King (#8, #17) — Sounds like you think that scientists had to look at ice cores to decide somehow that carbon dioxide controls the temperature of the Earth? Where did you find that idea? I’m curious what your source was, because I like to backtrack and figure out where mistakes originate. If I read you right, your idea seems to be mistaken so you question isn’t answerable as asked. Re 12 William, thanks for that link. The table of height against pressure should give me the info. that I am interested in. From your Figure 1b it could be that the height of the inversion layer has decreased wrt to pressure, but it will be interesting to see if it has decresed in height in real terms. But what that means is still difficult to interpret. Not at all. I am aware that CO2 is a green house gas. If there was an 800 year lag during which warming started without a CO2 build-up then, presumably, other factors are at work – e.g., orbital variations etc. How do we know how much of the subsequent warming is due to CO2 build-up and how much to whatever initiated the warming in the first place. And what eventually terminated the process? In principle, CO2 buildup could have been a result of ocean warming from other mechanisms and not a principal player. In other words, is the statement that CO2 is a major player in past global warming events based on models of radiative forcing or is there other independent evidence? Thanks for the reply to my #9. If my exploration sounded in any critical, please forgive me. By way of explanation, midst my neophyte ruminations, I’m still trying to visualize a qualitative temporal spatial Antarctic model to see what is going on… Relating the Circumpoloar current (ACC), a scheme for what the so called Antarctic Oscillation (AAO) is? All of the above which is not a topic of your journal contribution. Thanks again for the reply, and sharing the paper. The terrain is new to me, clearly. I’m sure it is based on models, which are based on physical principles. What else could it be? Even the exact role CO2 plays today is based on models (based on physical principles). The orbital cycles are regular, the GHG levels are recorded in the ice, I’m sure the geologists have an idea of where the edge of the glaciations were over time. All the forcings there are records for go into a model and if it matches the temperature trends then hooray. If not, there is data missing or the models need more work. #16 #20,, That is a hot topic, inversions (or the lack of steep inversions) are key with the whole process of Polar warming. I’ve recently noted higher temperatures, at the top of the inversion (the warmest temperature on profile), which eventually warms the surface air layer below , giving a weaker inversion lapse rate. Ultimately inversions may altogether occur less consistently has they use to be, trending towards a more summer like evening temperate profile. This is proved without Upper Air soundings by observing sunrise or sunset skimming, which is caused by refraction, in essence, the greater time the sun stays above the horizon, making longer days, the steeper the inversion, which may be defined by (relative to the peak inversion temperature) very cold surface air, of which colder air naturally increases refractivity. A healthy polar winter causes much longer days, while a warmer winter from the same location has significantly shorter days. Aren’t Antarctic surface temperatures in fact coupled to changes in the atmosphere above the surface? For example, whenever a cloud passes or the winds blow, surface temperatures respond – more so than in a situation of no inversion. And, by definition, much of the Antarctic plateau surface is in the middle troposphere to begin with (3-4 km above SL). The tropopause is, in summer at about 8km. In winter, it’s not that clear where it is. Besides the inversion, there is another interesting feature of the vertical temperature profile in the Antarctic winter: there is no real temperature tropopause; temperatures just keep decreasing with height until they reach about -90 C at roughly 20km, which permits the formation of polar stratospheric clouds. Re #25 Wayne, I think your reply has pointed me to the answer to this conundrum. The radiation calculations are perfomed using a vertical column of the atmosphere, but during polar winters the solar radiation is parallel to the surface. CO2 absorbs in the solar frequencies as well as in the terrestrial infra red. Therefore with a greater concentration of CO2, more radiation is absorbed and causes more heating in the the troposphere. The models do not see that warming because they are only concerned with the vertical component of the solar radiation which is nil. Wait, Alastair! sunlight parallel to the surface of the globe? Straight lines, curved surface; polar winter — no UV reaching the polar stratosphere, no ozone catalysis, in a very large area for months — no IR from sunlight either. Well, thanks but that link’s exactly where I started. I don’t see the answer there. Anybody? Is the evidence that CO2 was a major player in past global warming events based entirely on numerical models of radiative forcing or is there other independent evidence (beyond the observation of a lagged correlation between temp rise and CO2 levels increasing)? Models are fine and compelling (for me at least) but I’m interested in any other independent evidence that might exist. Re #28 Oh, dear :-( I was thinking of the situation over the poles during the equinoxes. It won’t last all winter. It will be pretty dark at the poles in mid winter, even at 5,000m. Oh well, back to the drawing board. Thanks – I missed your response. I was thinking in terms of, e.g., evidence that ruled out other causes (e.g, increases in solar radiation might be detectable??). Also I’m curious if there are simulations along the lines of correlating these warming events with Milkanovitch cycles. Bob, I think you’re asking whether there are past climate examples of large scale combustion of fossil fuel, or burning of carbon-containing rock (vulcanism? ), producing atmospheric carbon dioxide increases, from a “cold start” — like we have going on now. Is that right? What besides human activity can cause a spike in atmospheric CO2, and can it happen without human activity? There might be. I recall a suggestion that at one time the western US “badlands” were fossil coal beds that burned, once exposed by erosion (lightning fires). Can’t cite it at the moment, no time to hunt, see if you can find any mention of that geologic era, or the Deccan Traps vulcanism, as examples. P.S. –Bob, we’re way off topic here. Coby, are you doing a summary on this question or do you have one already on your list, or a pointer to where this is better discussed on topic? It stems from a recent piece in the Guardian newspaper by a molecular biologist called JohnJoe McFadden. His arguments are pretty flimsy and boil down to him arguing that observing a correlation doesn’t imply cause. This stimulated a discussion/argument with someone I know who basically agrees with McFadden. Now, I think the case is obvious and along the lines you suggest. But, given that McFadden decries models I am looking a bit more closely at what the full gamut of evidence is. In particular, (i) what specifically started the warming (ii) are there other factors that could explain the extent of warming besides CO2 and (iii) what stopped it. I’m really looking for links to technical articles along these lines. I do feel that the CO2-lag link (in this site) is a bit disappointing because (i) it sounds speculative and (ii) it never actually states on what basis the **majority** of the subsequent warming (after initiation) can be attributed to CO2. For example, how do we know that those warming events weren’t say 90% “other factors” (e.g., whatever got the ball rolling) and only 10% CO2. So I’m interested in how well this has been addressed. Of course, it’s a bit like arguing with creationists …. I’m not clear what the precise question is. I have an answer for “geological history does not support CO2 as a climate driver” (a little thin) and “ice cores show CO2 lags, doesn’t lead temperature”. Thanks – this all came up thanks to a badly argued article at the Guardian newspaper (online) by a molecular biologist called JohnJoe McFadden. which everyone keps pointing me back to – it’s sort of where I started – does a decent job of summarising the case but doesn’t really point to the evidence (specific studies, models, simulations etc.) underlying that summary. The latter is what I’m really looking for, i.e., a slighlty more detailed discussion of the potted version available on this site at the above link. This is getting off topic so apologies for that. You wrote “Of course, it’s a bit like arguing with creationists …. “. My point is that it is exactly like arguing with creationists. They don’t respond to common sense, and even less to logic, so there is no way you can win! Mankind seems to have a blind faith that because they are only enjoying themselves, then they cannot be destroying the planet. The only way you can change such an emotional attitude is with emotion. They won’t change until a disaster happens, and even then they may stay in denial just as has happened with New Orleans. Re #31: All of this refers to a rather different area of research than what’s being discussed here, but I’ll post a couple of links later tonight. There are a couple of interesting parallel lines lf research going on. First is by Wunsch and Huybers, who have been investigating the influence of the Milankovitch cycles on the Pleistocene glaciations. The upshot is that it appears the glaciations are driven by the @40ky obliquity (axial tilt) cycle. See this and this. While it seems clear that the obliquity changes are the trigger, the resulting direct insolation changes are only a fraction of what’s needed to drive the glaciations, and so some other mechanism must be involved. The David Lea group is advancing the hypothesis that the needed mechanism is greenhouse forcing of the tropical seas. See the discussion on Lea’s research page here and in particular this key paper (viewing the full paper requires a Science subscription, unfortunately). These two research threads may be headed in the direction of producing an overall explanation for the glaciations. While this makes sense to me, it’s not clear that the authors think so. There’s also very little recent activity from other scientists with regard to either area of research, although I notice that RC co-author Thibault de Garidel had a previous paper that criticized the conclusions of a prior related Lea paper. I don’t know whether that remains a live issue. All of this seems like a good topic for a post IMHO. Thanks – those links are very much appreciated and are exactly along the lines I’m interested in. Also, I agree with you re: a post on this – maybe the experts here could oblige? I would also like a post on the glacial cycles as a whole rather than just the existing lag vs lead article. I am worried that I went out on a limb here. Specifically, I am pressed in the comments and I say the climate behaviour over the Milankovich cycles is “fairly well understood” and it is orbital forcing amplified by ice albedo and GHG feedbacks. Is that reasonable? Also at issue is my statement “The rate of warming is on the order of 10 times faster today than seen in the ice cores”. William, back on topic, I wanted to congratulate you on the graphic at the top — it took me til now to study it. You’ve put a whole lot of information into it. Are you finding more datasets on a continuing basis? I went to Google just to figure out what “600 hPa” meant — I see it’s a barometric pressure, assume it’s the standard for measuring temperature using balloons because recording temperature and air pressure as the balloon rises is straightforward (and no other kind of altimeter has been available until electronic ranging devices came along recently). Could you give us — or point us to — more background for the lay reader on the data collection generally? I just picked up Kim Stanley Robinson’s novel “Antarctica” and was reminded that when the first explorers reached Antarctica, they were collecting information without much idea how it would be used. The sudden change from a 2000 year old technology, wooden ships and sail, to steel ships and steam, was just happening — and science was just starting to happen. They were collecting for us, whoever we turned out to be, figuring we’d be able to use the info. Are there datasets you believe exist somewhere that you’re still looking for? new geological epoch may be starting (sorry, cannot retrieve the post any more). Reviewing the EPICA and Vostok ice core data gave me that impression some time ago. I even coined a name for it: “Technocene”. Dr. Hansen also states in recent presentations his view that the ice ages will not come back for several millions of years. “Geological epochs” are mainly defined by the kinds of deposits that are found in rocks and soils. These deposits are commonly of biological origin and the term “biological epochs” could be used instead. Ending the period of regular ice ages may indeed cause a biology disruption qualifying as the start of a new epoch. Warmer and cooler cycles will of course continue, but both the average level and the “waveform” will change. There is a strong asymmetry in the recent record. Currently, cold part (ice age) of the cycle is strongly limited (and lengthened) by some part of the process, assuming that the orbital forcings have an approximately sinusoidal shape. The reason may be geographic. There are a number of major continental boundaries that run in an East-West direction. When a climatological zone meets such a boundary, unlinear response can be expected. Examples are the regular movements of the ITCZâ��s crossing the southern shore of West-Africa and the northern shores of South America and Australia, or the snowline (or permafrost boundary) moving across the coasts of Siberia and Northern Canada. A source of (unpleasant) surprises is also the carbon cycle. There are several major storage bins of carbon. For obvious reasons, our focus now is very strongly on the deeply buried and very slowly turning carbon deposits of oil and coal, and transferring them into the short cycle surface/atmosphere process. There are other storage bins of similar or higher volume: soil and permafrost, clathrates in the deep seas and ocean water itself. Inadvertently activating carbon from these relatively long term storage cycles generates major positive feedbacks. These are currently seen as the extreme disaster scenarios of low probability. As to the timing of temperature and CO2 cycles. It makes little difference. In the “natural cycle” temperature may be the prime mover (input or forcing), CO2 a feedback. In the “artificial cycle” CO2 is the forcing, temperature is part of the feedback. In a control equation you may change the input or you may change the feedback, and still get the same output. You state that, contrary to press reports, as shown by Cecilia Bitz’s RC post there is not that much difference between the model projections and the findings in Turner2006. But comparing fig2 of your paper http://scienceblogs.com/stoat/upload/2006/03/science-turner-2006.pdf with fig2 of Cecilia Bitzâ? ?s post, http://www.realclimate.org/bitz_fig3.png . The warming area in Turner Fig 2 around 120degW, appears to be projected as an area of no change in Bitz Fig 2. Note that in Bitz Fig2 the no change is also projected over the western Antarctic Peninsular, this seems different to the Southern Pacific cooling shown in Turner Fig2 at around 120degW. I am no expert, but I had thought that little change in Antarctica was anticipated at this stage. I recognise that Bitz Fig 2 is based on deg C/Century, whereas Turner Fig 2 is decadal. Furthermore it’s tricky to try to compare the 2 different projections. And I don’t know whether I am comparing apples and oranges in the datasets. But they donâ? ?t seem to be that similar to me. Stephen Berg, the blogging software used here has bugs which prevent it from understanding links containing commas. We know Christy et al. aren’t happy with your results. Have you any further news to relay about the food fight? Also, I sent you 2 e-mails, but have not seen any reply. If you sent anything, then we must assume it(they) was (were) lost in some “hole” in the net…. I see Turner et al. including Connelly have cited your paper. It is good to see that your work is recognised. I am curious about Christy et al.’s reaction. Do you have a reference where it can be read?